9 year old (yes it's true, sadly) UFO, finally complete. I'm going to send this one to Bumble Beans Basics. I've also finished some other projects that need to wait before they get their turn on the blog. 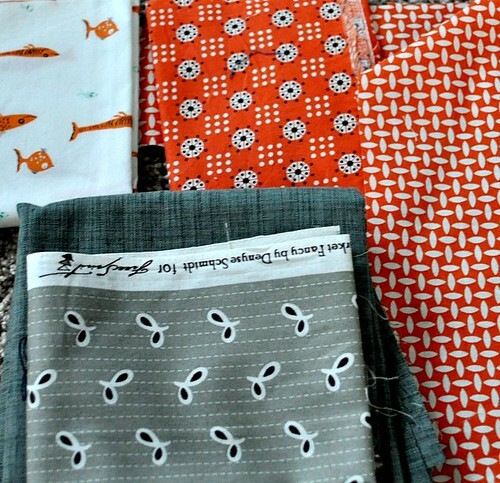 And I spent some time picking out fabrics for a new quilt. Because I want to. I'm planning on making another circle quilt. This one will be bigger, I'm thinking 60x80 inches. 48 quarter circle blocks that are 10" square finished. I had a wider assortment of colors picked out at first and decided to try out a primary color scheme this time. I don't have very many blue fabrics. I am going to make my templates for this one right away. What are you working on? Do you have any secret (or not) holiday projects you're making this year? We moved into our house last Friday and are trying to get settled in. Things have been busy--the boys are going to new schools *again* (sigh) and they each had a sick day this week and I've been a bit under the weather myself. And I'm working on getting things somewhat organized in our new space. The black hutch was in the kitchen at our old house and it doesn't fit in the kitchen here. I am going to use the main cabinet area for my small fat quarter bins. I have 5 of them, sorted by color. And somehow they all got packed into different random boxes. I've found four of them but am still missing the red/purple bin. I hope it shows up soon. 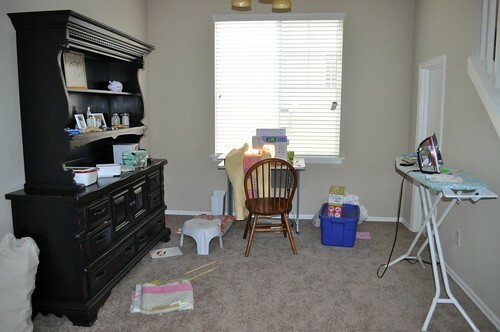 The door on the right is a little closet under the stairs, which is perfect for storing my big fabric bins. I will probably get a new, bigger, sewing table eventually, but this little gray table will work fine for now. 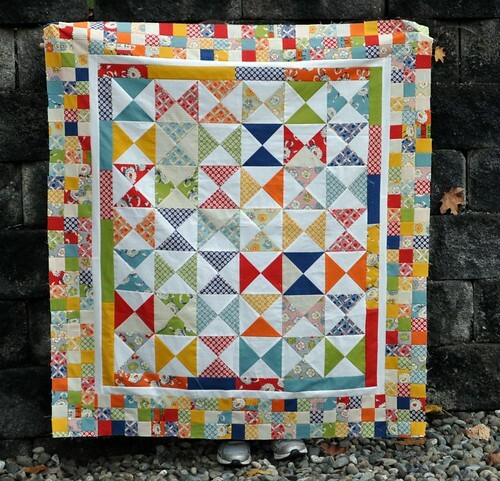 This little quilt is from a few years ago when I was trying to decide if I wanted to make and sell quilts for a business. It's been pin-basted and waiting, for a long time. I don't want to sell quilts for a business. 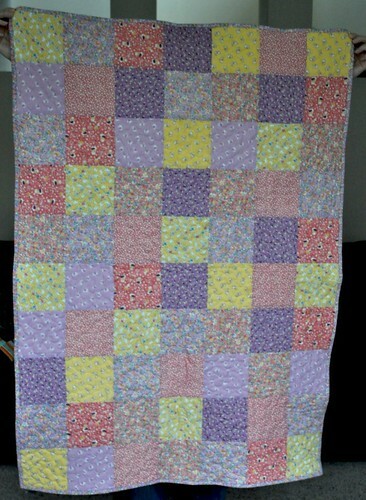 But I decided to finish this up and send it in to the Bumble Beans Basics quilt drive. A while ago I looked at my goals for the year and I had said I wanted to make two quilts to donate to charity this year. 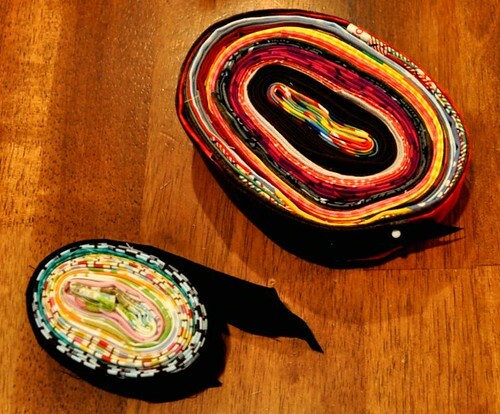 Victoria from Bumble Beans is asking for quilts that will be given to families in NYC who need them. More information here, if you're interested! I am not sure how my time will be organized here yet. Things are good here, but a lot different. My boys each had about 6 more hours of school each week in Kansas, and their schedules are quite staggered here (one leaves at 7:10 and one leaves at 8:50) so that means I have more time with them one-on-one, and a bit less time for my own personal stuff. Which is fine, just different. I am going to have to get more organized and settle in a bit more before I will be able get into a good routine for blogging. I did want to share one cool thing before I go--750 Words. Melissa, who is Living a Creative Life, shared this site a few days ago and I signed up that day. If you are familiar with the book The Artist's Way by Julia Cameron or morning pages, which are a part of the Artist's Way program, it is a website for doing morning pages-type writing online. It's not really the same as writing them out long hand with a pen and notebook, but it is a good substitute and takes less time. Which is good. I've written my 750 words for the last 10 days and it helps me dump my brain out, figure out what I need to be doing, what I want to do, and what is important to me. So go check it out! Overall I really like it. I bought this fabric because it reminded me of my Grandma Taylor, and these colors still make me think of her. (I think this is about a 2-year-old UFO.) That outer border was frustrating to make, and it has some mistakes, in part due to seam allowance consistency problems caused by the pinked edges of the precut fabric. I think if I make something with little fiddly squares again, I will trim the pinked edge off first. *Hourglass blocks started as 6" squares and I'm not sure what they finished at. 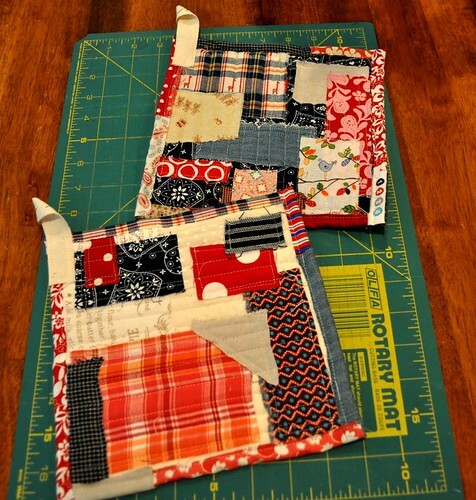 *First border is 2" (cut measurement) strips of the more solid fabrics I had left over. *2nd border is 1.5" strips cut, finished at 1" wide. *Outer border started as 2" squares. Actually I did a little bit of strip piecing, just to get the fabrics for that border into pairs, then I sewed 4-patches and then added another pair to make 3x2 units. And then I didn't have enough squares so I cut a few more strips and added a few 1x3 segments in as I was piecing together the 2 long borders. Also, I didn't do the math to make the squares in this border fit on the quilt exactly right. 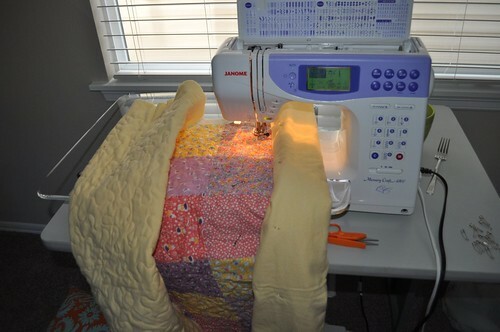 *The solid is a quilter's only solid from JA, can't remember the name right now. *Finished measurements of the top are about 43"x47". In other news, we are ready for the next big step in our relocating adventure. Tomorrow morning, the moving truck is bringing all our things (that we said goodbye to on September 15) to the home we are renting. We are looking forward to having more light, more space, and a shorter walk from parking to the front door. And of course we are excited to have all our things back too. 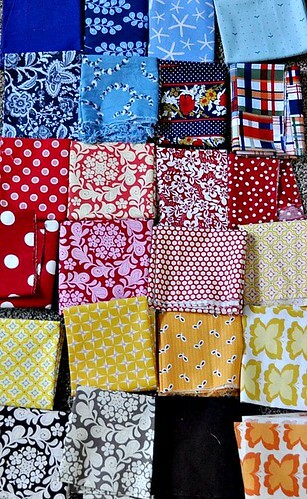 I am looking forward to seeing my colorful dishes, my kitchenaid, and my fabric/sewing machines. I'm most looking forward to settling down and hopefully feeling like we are home after all these months of the upheaval that comes with moving. This is the only picture I have of #2 wearing his ski mask. He was a robber; I convinced him he needed the getaway bag with a dollar sign so people would know what he was up to. I love how the dress turned out, it was a lot of work but I'm happy with it in the end. (A lot of work like my sewing machine doesn't have a zipper foot and I was going to just sew it in without one but then there was the extra layer of the overskirt and well... I just handsewed the thing. The lace didn't stay in place either so it's all handsewn --tacked really-- down.) Anyway, my little girl loves it, and that helps. I'm glad it fit her right, because I didn't check out the pattern on patternreview.com or measure it beforehand. I'm happy that Halloween is over and looking forward to Thanksgiving and Christmas and moving out of our apartment, next week!